A demonic manifestation expressed through death metal of unprecedented baroque flourishes, Here In After seethes with violent emotion and incomparable forward momentum. Immolation when on song presented a seductive counterpoint to the bludgeoning heard on contemporary band Incantation‘s early works. The lyrics establish a readily identifiable theme of loss of faith, but the music, despite all its unorthodoxy and technical prowess, emerges as true victor, proving one of the finest examples of absolute metal the genre has known. Here In After‘s great achievement is in reconciling the writing heard on debut Dawn Of Possession with a startlingly innovative approach to composing riffs at the micro-level. Where Dawn Of Possession was mostly linear in its dissonant progression of phrases, Here In After posits the tritone as the fundamental building block of the riff itself (contrast the long-form, tremolo-picked melody on ‘Nailed To Gold‘ with the contorting opening riff heard on ‘Here In After‘). The result predicates greater room in song structures to avoid the dreaded bleedover effect observed in music by newer bands like Deathspell Omega and Adversarial. Rhythm is chopped up into serrated shards to accommodate this development; drummer Craig Smilowski sits in on one of the great percussive clinics, doing much more than merely shadowing the many swells and troughs of these songs, but without compromising his sense of restraint in the process. However, no discussion on Here In After can be complete without mention of guitarist Robert Vigna’s ferocious and genre-bending playing. On the song ‘Here In After‘, right after the opening riff, is a section where Vigna slides up a dissonant interval. It is executed with tremendous tremolo-picking speed, but the real playing innovation here is that he slides up the interval in progressive gradients with a slowly gathering momentum. He starts slowly, as if to announce his intent, then breaks out into a jog in the middle stretch, and finally rushes towards the ending note like a headlong jump into the abyss. In doing so, Vigna essentially eliminates the fretted, whole-tone nature of the guitar, and brings into focus the microtonal possibilities available to guitar playing. It is a small maneuver but breathtaking in conception, individuality, and portent. The dense nature of these songs does not preclude them from having a very real sense of melody; it may feel like somewhat of an oxymoron, to have atonality and dissonance in conjunction with melody, but the former two attributes when applied in the right proportion, with consistency, with musicality, and with due diligence paid to phrasing and groove, develop melodic rules of their own. That no supposedly abstruse death metal album has contained the intensely narrative thread witnessed on Here In After is a testament to this fact. A new paradigm cannot be ushered in gratuitously, out of a childlike eagerness to be different. To innovate is fine, but to know why is true wisdom. Nespithe is a companion piece to Here In After, only originating in a parallel dimension. Science fiction writers have frequently deliberated on how unapproachable an alien intelligence would be from humanly constituted standards, moral, ethical, or civilizational, in general. 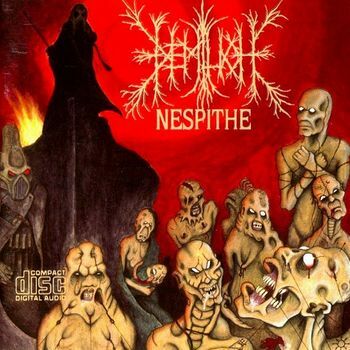 Nespithe is a musical encapsulation of that premise; broadly based around the Finnish style of death metal, Demilich upended nearly all conventions of death metal riff writing, and still managed to emerge as a legitimate, cosmically-inclined addendum to the genre. The unconventional part to Demilich‘s riff writing consists of commencing on a seemingly random note and then winding down the octave in a mostly haphazard manner; haphazard because there is no discernible logic to the constant upturning between the bookends of any given phrase; think of a crowded bar graph with prominent starting and ending bars, and a whole multitude of varying-sized towers in the middle. The rhythm provides the barest of outlines, but the primary agent of motion and melody on Nespithe is the singly-plucked note, which through the many intoxicated permutations and combinations somehow always manages to come out of its trance with balance in tact. It is a commendable skill, and one that could not be consummated – again, like Immolation – without an expert knowledge of groove and phrasing. As much as Demilich enjoy larking about and going on absurdist, improvised tangents, they adhere religiously to the rules of their universe, thereby acquainting the listener with an eventually recognizable vocabulary. However, unlike Immolation, the nature of Nespithe‘s building material is such that while it focuses the listener’s attention on the many mysteries of its world, it fails to enhance his understanding of his own. Nespithe wears thin over its second half, in no small part due to the ambiguity and other-worldliness that makes it special in the first place. A palpable sense of “fun” also proves incapable of standing up to the withering glare of Here In After. Immolation wrote romantic maelstroms depicting the struggle between purported good and misunderstood evil. It is a literary and technical accomplishment in the field, and decidedly the better album of the two. This entry was posted in Death Metal Battle Royale and tagged Dawn of Possession, Death Metal Battle Royale, demilich, Finnish death metal, Here In After, immolation, Nespithe. Bookmark the permalink.